Aaron Ramsey gave boot-spotters plenty to talk about this weekend, as the Arsenal midfielder turned out against Hull City in all-black, unbranded football boots as he seeks out a new football boot sponsor deal. The Welshman caused plenty of confusion this weekend, wearing a completely black pair of football boots which were soon identified as Nike Tiempo Legend V’s with the trademark Nike Swoosh removed from both flanks. Having worn the adidas Predator much of his senior career with the Gunners, Ramsey seems to be in the process of finalising a new deal with a new football boot sponsor. 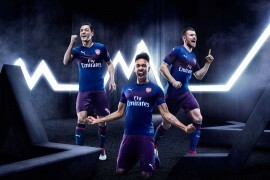 Ramsey has been in fine form over the last twelve months in spite of spells out with injury, so it is somewhat surprising for adidas to have allowed the 23 year old to listen to offers from elsewhere. The current front-runner is Warrior. The Liverpool kit suppliers have allowed Thomas Ince’s contract to lapse recently, and would certainly see the benefit of giving the ‘Gambler’ silo a fresh face, particularly one capable of Ramsey’s Champions League pedigree. Current sources suggest that [twitterShare]Ramsey’s deal with Warrior is all-but official[/twitterShare], with the Welshman set to launch a new boot alongside announcing his arrival with the American brand, in the style of PUMA and Cesc Fabregas.